Up to 6 WEEKS rent free + $500 Visa gift card on select homes. Call for details! 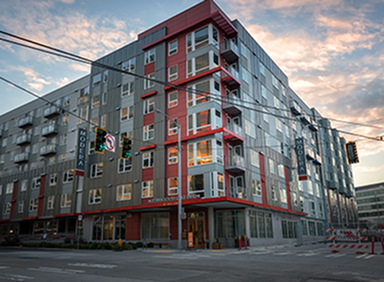 On the border of the Atlantic and Squire Park neighborhoods stands Seattle's new standard of apartment living. It is away from the hustle and bustle, yet close to culture, action, and excitement. It is steeped with luxury, yet surrounded by convenience. It is community-minded, yet urban-styled. Though it is just east of downtown, it is located in the center of one of Seattle's largest and most beloved neighborhoods. It is Modera Jackson, a new collection of 160 studio, one-, and two-bedroom luxury apartment homes designed for the urban-paced resident seeking a community experience unlike any other in Seattle, Washington. This upscale community offers an abundance of spaces for you to choose your escape, including a fitness studio, theater room, outdoor courtyard, sophisticated rooftop club room and roof deck with commanding South-to-West skyline views. Inside your apartment, you'll enjoy all the comforts of home with features that include energy efficient, stainless steel appliances, quartz countertops, and plank flooring. For a seamless outdoor experience, select homes include Juliette balconies complete with expansive windows. Feeling up for a night downtown to experience Seattle's great nightlife, diverse culinary scene, or fine arts? Modera Jackson makes getting to Seattle's go-to spots easy. The community is within walking distance to Seattle's new First Hill streetcar, where you'll find yourself only four stops from the bustling nightlife of the Pike/Pine near the world-renowned Pike’s Place Market. Triangle and three stops from the historic nightlife of Pioneer Square and all your Sounders pregame festivities. By 2020, the streetcar line will even offer single-trip access through downtown and South Lake Union and beyond. So whether you are seeking neighborhood convenience, plentiful amenities, or luxe living spaces, you'll relish a lifestyle where downtown style and suburban comforts merge at Modera Jackson. Want to be among the first to call Modera Jackson home? Connect with us today.